Yet again I have a new book sitting on my shelf, beckoning me with fun projects. “Sew Gifts!” from That Patchwork Place has been tempting me for a few months now. I purchased it largely for the project on the cover and the Dresden Pouch shown on the Introduction page. I am indeed getting lazy because I know I can figure out most projects in the book without instructions, but I just don’t want to anymore! The book contains 22 projects from 22 different designers. It contains beautiful photographs and decent instructions with drawings to illustrate steps. Here is the Introduction page showing some of the projects. You can look at the amazon description of the book here. The projects not shown on amazon’s website are the Sweet Bird Drawstring bag (hand-embroidered bird embellishment on a drawstring bag), Pieced Kimono Scarf (or table runner), Travel Backgammon Set (rolled up board with fabric-covered button forms for pieces), Sewing Kit in a Jar (flowering cactus pin cushion on lid of jar), Little Girl Bake Shop Set (apron, hot pad and fabric cupcakes), Holiday Apron, Casserole Carrier (like a zippered fabric suitcase with handles on the side), Must Have Mug Rugs (striped and appliqued mug rugs), and Vine Pillow (pillow with appliqued vine). All of the projects are pretty cute and look reasonably straightforward to make for a somewhat experienced sewer. I have never been able to achieve such a lovely zipper end despite careful attention to instructions. If you look at the photo of my pink pouch (the first one I made), you’ll see that I did not achieve the same outcome. 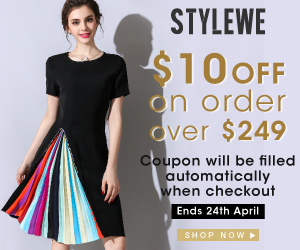 I contacted the designer and she was kind enough to give me some advice. Here are the altered instructions. I think that the zipper ends on the second pouch I made (the brown one) indeed did look better. But I still suspect that the pouch in the book was constructed differently. In general, the written instructions for the project were fairly clear and the drawings were helpful. But I suggest you be careful with the two template outlines in the book. I cut plastic templates for the Dresden wedge and the half-circle. Either the wedges are too short or the half-circle is too small. I ended up redrawing the half-circle pattern. For my second pouch, I made the Dresden wedge a about a half-inch longer so that my pouch looks more like the pouch in the book. But I didn’t make the new half-circle quite big enough, so I failed to catch some of the raw ends of the Dresden wedges. Fabric glue to the rescue! 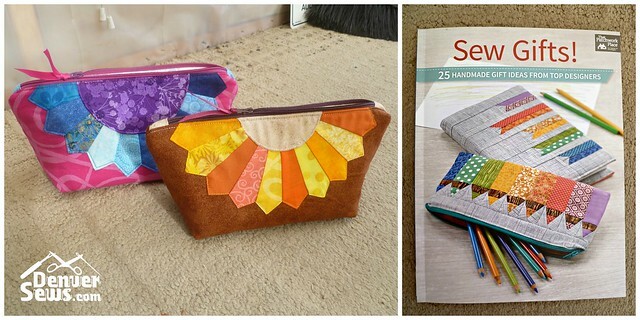 I did make one deviation from the instructions: I used Pellon Fusible Thermolan Plus (TP971F) interfacing on the exterior pieces to give the bag more substance. And I used Pellon Featherweight Fusible (911FF) for the lining pieces. The instructions call for only interfacing the exterior fabric with fusible medium-weight interfacing. Overall, I really enjoyed making this project. It only took a couple hours and I got to use some of my very small scraps. I think it would make a nice gift. The book overall has some cute things to sew. I’d like to make the pencil pouch on the cover. I think it would work nicely with paper piecing. The owl pincushion is also extremely cute. 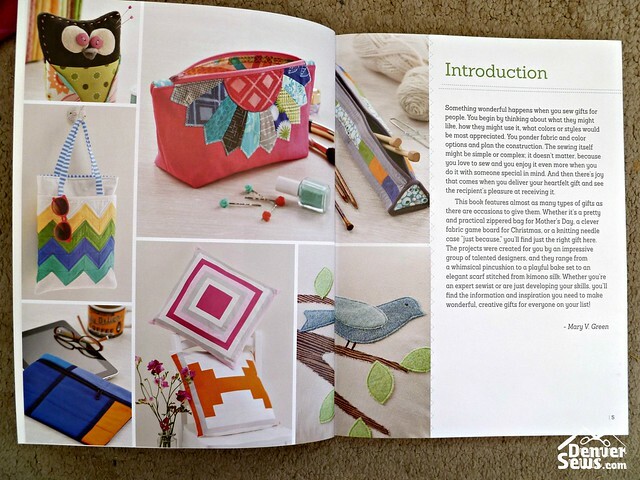 If you’re looking for some cute gift ideas to sew, this book might be for you. Just be cautious with the instructions as there may be some small mistakes. (Note: That Patchwork Place did not have any errata listed for this book). Lynne, your projects always inspire me. I’m going to try to make something sort of similar, a three-section zippered substitute for a billfold for my credit and id cards (Why does every store expect me to be a special member and carry a card just for their store in order to get the best prices–Fred Meyer, Safeway, Hancock Fabrics, Lowe’s, Home Depot, Molbak’s, Albertson’s, QFC–is there no end to them? It’s annoying. And that doesn’t even touch the city, county, and adjacent city library cards or actual credit cards . . .) It’s still in the planning stage, but your project has given me some ideas about how to improve on the sample I have. Keep up the good work! Super cute Lynne! 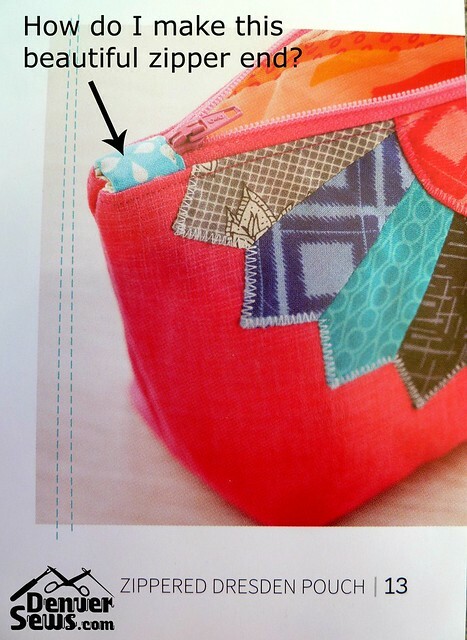 These projects would be a great way to explore patchwork without the huge time commitment of sewing a quilt. I think these would make great gifts also. Thanks Kitty! BTW, I now have two pouches that need a home. Would you like one?